The University of Iowa and the UI Institute for Vision Research announced today that Alice and John Butler of Dubuque, Iowa, have given $5 million to accelerate progress toward treatments for blinding eye diseases that affect millions of people worldwide. The gift will establish the Alice L. and John E. Butler Vision Research Fund, which will support gene- and stem-cell based treatments for degenerative retinal diseases. Drs. Budd Tucker (left) and Ed Stone (right) beside a sterile isolation chamber containing one of the robots in development for the University of Iowa's Institute for Vision Research therapeutic stem cell program. The Butlers' gift will benefit the UI’s clinical stem cell transplantation program and its goal to restore useful vision to people with advanced stages of retinal degenerations—ranging from common conditions like age-related macular degeneration to rare genetic forms of retinitis pigmentosa. 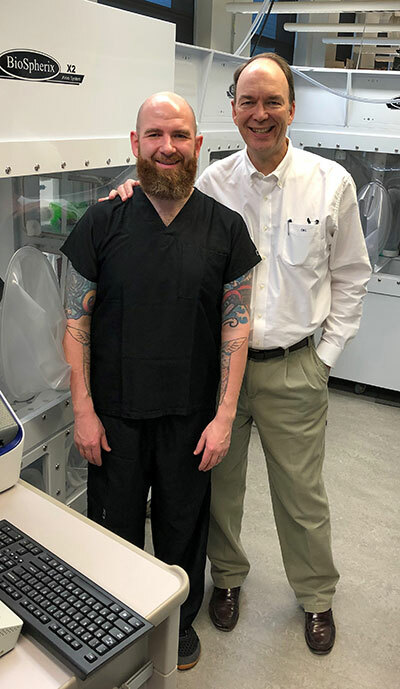 The program seeks to use stem cells derived from the patient’s own tissue, correct gene mutations, and transplant them into the patient’s retina to restore vision. The gift will also support new research, including the effects of retinal degeneration on the ability of patients to drive safely. “The loss of vision has a significant impact on a person’s life, and many of the conditions that cause vision loss are genetic. Being able to help identify and perfect a solution to prevent this from happening to people is incredibly impactful and meaningful to us,” said Alice Butler. “The Butlers' generous gift will support the state-of-the-art equipment and very talented people needed to move our gene- and stem-cell based treatments forward, which will ultimately allow us to restore vision to patients who have lost it,” said Dr. Edwin Stone, UI Institute for Vision Research director. Alice and John Butler have given their time and resources to countless organizations in their hometown of Dubuque and beyond. In 2011, the couple was awarded the Dubuque Telegraph Herald First Citizen Award in recognition of their contributions to the community. John Butler is the fourth generation in his family to lead Dubuque-based Cottingham and Butler, Inc., the fifth largest privately held insurance broker in the US and the 28th largest insurance brokerage firm in the U.S.
Support the Institute for Vision Research today.